Persecution because of homosexuality is rarely accepted as grounds for political asylum in Finland. However, it is a fairly common reason for applying for asylum. Esko Repo, head of the asylum unit of the Finnish Immigration Service, says that of the approximately 4,000 asylum applicants in Finland last year, a “three digit number” mentioned persecution on the basis of sexual orientation as the reason that they were seeking asylum. 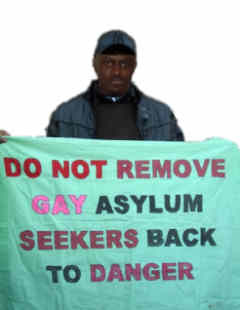 The gay rights organisation SETA, the Finnish section of Amnesty International, and the Free Movement network are currently campaigning on behalf of a Zimbabwean man who has applied for asylum three times because of persecution for his homosexuality. The man came to Finland as an IT student in 2002. He applied for asylum the following year after officials in Zimbabwe learned of his homosexuality. The man has been refused asylum in Finland. The organisations campaigning on his behalf are now trying to reverse the decision to send him out of the country. They have organised a demonstration on his behalf in Helsinki. Homosexuality remains a crime in more than 70 countries, and it is punishable by death in Iran, Yemen, Mauritania, Nigeria, Saudi Arabia, and the United Arab Emirates. Homosexuality is a taboo in several Middle Eastern and African countries, and is punishable by imprisonment. The rights of Ugandan sexual minorities came under the spotlight recently when a Ugandan tabloid published the names of 100 homosexuals in the country, and called for them to be hanged. Homosexuality was decriminalised in Finland in 1971, and it was removed from the list of illnesses in 1981.